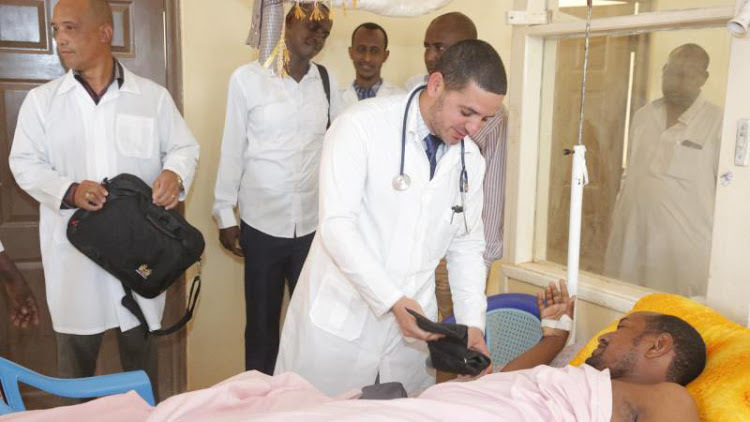 Cuban doctors the two cuban doctors busy treating a patient at the Mandera county referral hospital in February this year. Police have been allowed to detain a Mandera County Government driver assigned to two Cuban doctors abducted last week by suspected al Shabaab militants. Nairobi magistrate Muthoni Nzibe said the police could continue holding Issack Ibrein Robow for 15 days to complete investigations into the kidnapping of Drs Assel Correa and Landy Rodriguez. The Anti-Terrorism Police Unit through the DPP had asked the court to remand the driver for 20 days to enable them to carry out further investigations but the court directed them to detain him for 15 days. He will be detained at an undisclosed police station in Nairobi for security reasons. His close family members will be told where he is held. Police suspect that the driver might have been involved in the plot to kidnap the doctors. The court was told that Robow had other associates who were assisting him in planning and executing the kidnap and there was a need to carry out detailed interviews with him and his associates once they are arrested so that the co-conspirators are known. Investigating officer Abdishakur Adan said that Robow was arrested on Friday evening at Mandera town by ATPU officers and flown to Nairobi on Sunday. At the time of the attack, he was ferrying the doctors to the Mandera County Referral Hospital in a Toyota Hilux. “The two doctors were escorted and guarded by two police officers – Rahmadhan Barua Kesi and Mutundo Ngala,” Adan said. A few kilometres after picking the doctors from their residence, a Toyota Probox blocked the Hilux. The occupants of the Probox opened fire on them. The attackers, suspected to have been three, shot and killed one AP and kidnapped the doctors. They sped away towards Bulla Hawa in Somalia. “At the time of his (Robow) arrest, a mobile phone was recovered from him which is currently being forensically examined and the reports are yet to be obtained and analysed,” the court heard. Police further noted that the activities of terrorists and their associates were a great risk to national security. Robow’s actions must be fully investigated, the court was told. The case will be mentioned on April 30.